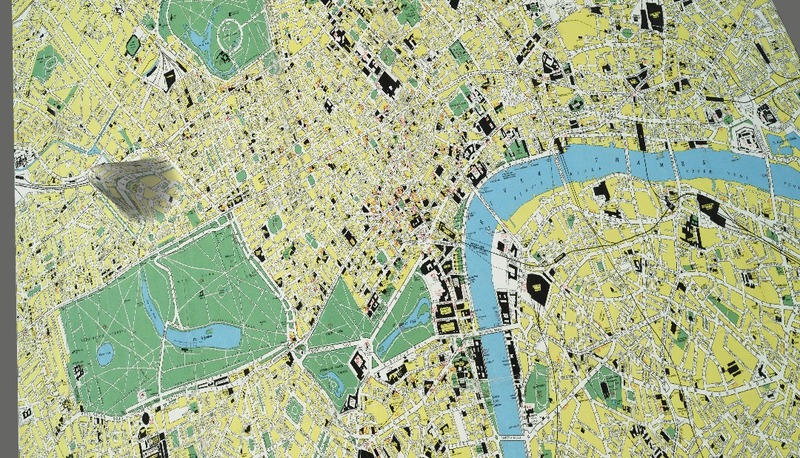 I participated in a seminar on Modernist London and the Digital Map (organized by Stephen Ross, Katie Tanigawa, and Alex Christie, all from the University of Victoria) at the Modernist Studies Association conference in Boston in November 2015. 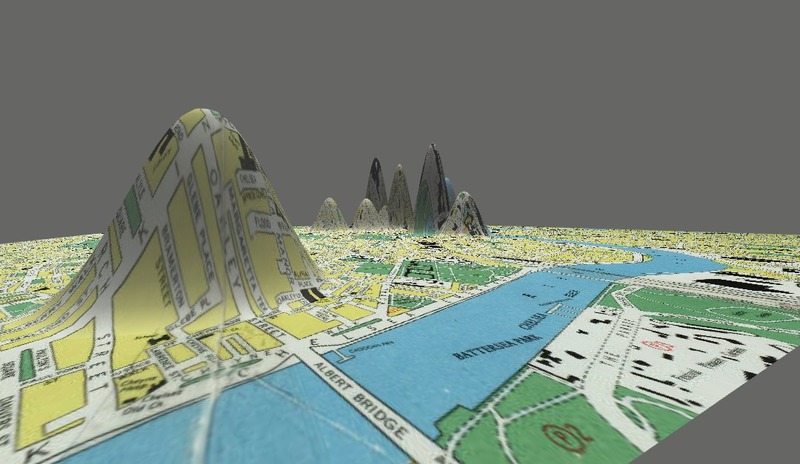 Seminar participants were all invited to use Z-Axis mapping tool, to explore modernist texts set in London. The paper I circulated follows. Z-Axis map of the full text of Jacob’s Room. Uvic’s Z-Axis map tool is an invitation to read spatial references in novels in critical ways. The warped shapes on the maps make the places less legible, transformed by the literary meanings attached to the place in the novel. DH mapping projects that use tools like Google Maps or CartoDB produce visualizations that present a space and its meanings as flat, discoverable, conquerable, with all the weight of imperial history exerting on the Cartesian form. The Z-Axis tool transforms the map, making it less legible, and more suggestive, and prompts its interpreters to return to the novel to make interpretations and new meaning and readings of the text. Literary writing, lived experience, and history bring to bear layers of meaning on a place. The warped peaks on the Z-Axis map invite readings that take into account these intersecting meanings. I put the plain text file of Jacob’s Room into the Z-Axis tool after removing just a few of the names the Named Entity Recognition script mistakenly recognized as location names (London, as recommended in the instructions, Jacob, Timmy, Rebecca), and then set it to mapping. The largest peaks seem to be around parks. I recall the discussion of monuments and memorials in Jacob’s Room, so this seems right. It’s difficult to read the map when it’s warped by the peaks, and I don’t know London geography quite well enough to interpret the significance. I find myself wishing for a text box beside the map, where one could see the textual references that produced the peaks. In the list of location names, it was clear that many, many of the detected location names were not going to show up on the London map (or if they did, they shouldn’t have). In fact, many of the names were not location names, but nonetheless suggested a far-off location that was at the same time central to the British imperial worldview that produces the war and Jacob’s death in it: Latin, Mohammedan, Moorish, Roman, Persia, Greek, Chinese, Russian, Turkey, Indian Ocean, Italy, Greece, Gibraltar, Acropolis, Athens, Ireland, India, Newfoundland, Rome, China, Elgin Marbles, Parthenon (13 occurrences), Rangoon, Olympia (7 occurrences), Corinth, Salamis, Erechtheum, Athena, Hymettus, Pentelicus, Constantinople, Delphi, Euboea, Albania, Morocco, Venezuela, Achilles, Syrian, Lahore, Calcutta, Singapore, Piraeus, and so on. Full text of Jacob’s Room on the 1966 base map. 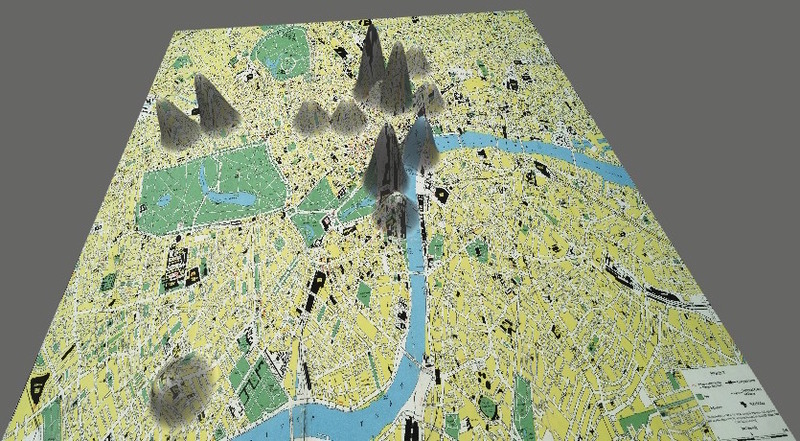 Mapping Jacob’s Room with the Z-Axis tool on historical maps of London offers a starting point for a spatial reading of the novel. Woolf plays with the spatial ideas of center and periphery throughout, with the experience of war-death represented in the clearing out of Jacob’s room by his mother and Bonamy, rather than from a trench scene on the continent. Similarly, public monuments to war and parades on city streets mark the complicity of everyday acts in the waging of war. 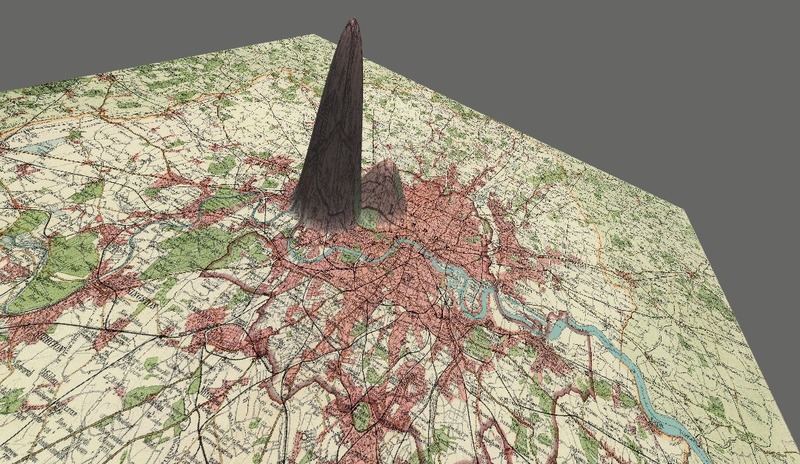 For instance, Hyde Park is one of the peaks on the Z-Axis map. 70-80% of Jacob’s Room mapped on 1922 base map. This reference to a war memorial erected by the women of England is an accusation. Woolf accuses the public memorial of contributing to war culture–as Jacob becomes more and more like a statue of himself. Jacob’s trip to Greece, with stops in France and Italy on the way, is in line with this cultural, imperial authority that grants young men authority while also damning their flesh and blood to the violence of war. The statue of Achilles that stands as a war memorial; the Elgin marbles in the British Museum; the lessons learned at Cambridge build a direct line between the ruins in Greece and the culture of Britain that marches toward Jacob’s death. Though the novel’s center is Jacob’s room in London, the text’s imperial gaze (to the British empire and historical empires) goes considerably further afield. If we map 80-90% of the novel’s text, there are no mappable locations in London detected. Map of 81-90% of Jacob’s Room on 1922 base map. The room at the center of the novel is surrounded by war memorials and parades, universities, Greek ruins, colonies and former colonies. The narrator declares that all of the action of the world takes place, “yet all the while having for centre, for magnet, a young man alone in his room.” The spatial arrangement laid out by the novel, then, ripples out from Jacob’s room: to the streets of London, public parks, and institutions of European civilization, especially the British Museum; to other regions in England, including the halls and chapels of Cambridge, and his mother’s home; to the seas surrounding England; further afield, to the empire, considering Home Rule in Ireland, India; to Europe, France, Italy, Greece; and the moon. Through all of these various places and scales of spaces, war and imperial culture pervades, and people attempt and fail to connect and communicate. Letters mark these attempts at communication across the novel. As the narrator reflects, “they lace our days together and make of life a perfect globe. And yet, and yet…” (125). Betty Flanders is an ideal letter writer (“how interesting her letters were, about Mrs Jarvis, could one read them year in, year out, the unpublished works of women, written by the fireside in pale profusion” (123)), but Jacob leaves his mother’s letters unopened and in his replies omits the most important of his life experiences, in “mendacious” letters. These scattered, myriad messages circle around Jacob’s room at the center–by the end of the novel an empty room, whose occupant has been killed in a senseless war. Woolf addresses the war via the culture off the battlefield. She prompts her reader to ask how it is that the universe, expanding outward from Jacob’s room, organizes itself in such a way that he must die in the war. The experiment of reading with the Z-Axis Tool is iterative, a process of intertextual reading between the novel’s text and the warped map and its transformation across the course of the novel. Andrew Thacker recommends multiple directions in reading the city in modernist texts: to “reconnect the representational spaces in modernist texts not only to the material spaces of the city, but also to reverse the focus, and try to understand how social spaces dialogically help fashion the literary forms of the modernist text” (4). As a user, I want to see the corpus or excerpt of the corpus currently represented on the graph so that I can better understand the literary context of the map. As a user, I want to export a csv file of the location names and geocoordinates, so that I can assess the accuracy of the georeferencing. As a user, I want to upload a csv file of the location names and geocoordinates, so that I can supply data that corrects or supplements inaccurate named entity recognition or georeferences. As a user, I want to view the location names currently represented on the map, so that I can assess the accuracy of the georeferencing. As a user, I want to be able to access and edit the plain text file with Named Entity Recognition tags to add or remove location tags. Moreover, I would be interested to think through references to places—the novel’s geographic imaginary—in comparison with the locations where the action of the novel takes place. I am also curious to know how, or whether, the different base maps affect the warping of the maps. For instance, what seems to be a peak around Hyde Park in the 70 to 80% range of the novel on the 1922 map (pictured in Figure 3), on the 1966 maps appears much different. Being able to view the place names that are represented on each version of the map would help me to interpret these differences. Map of 70-90% of Jacob’s Room on the 1966 Base Map.